As I mentioned last week, my family and I decided to celebrate in a different way this year, Mexican-style! We celebrated this past weekend with festive drinks, food and desserts. It was a Feliz Navidad indeed. 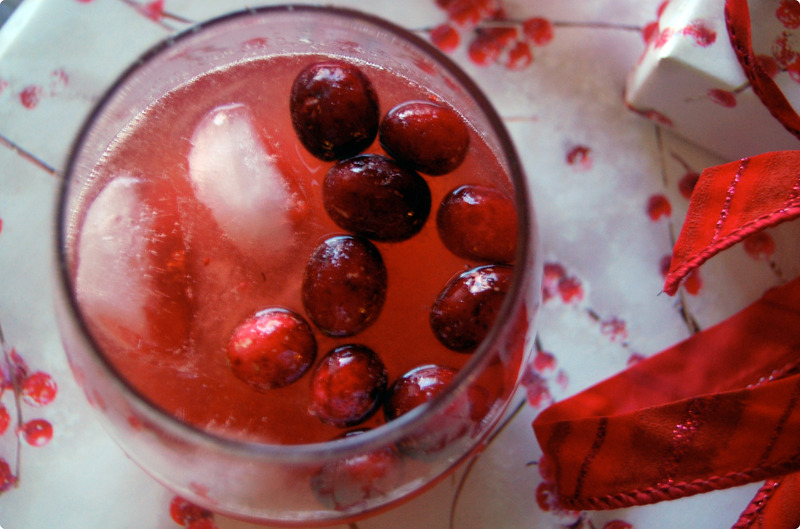 To start the party out, I served Cranberry Pomegranate Margaritas using a recipe I found on the blog, My Life as a Mrs. Potent, but festive! After making a special trip to my new favorite grocery store, El Rey, I put together a spicy Mexican meal that got us all in the Christmas mood. The shining star of the meal was the Chipotle Pulled Brisket Taco. Cooked in a slow-cooker, the beef was juicy and tender with a little kick. In a slow cooker, place brisket. Pour in apple cider vinegar and diced tomatoes, including the juices. Add minced garlic. In a small bowl, mix together chili powder, cumin, coriander and sea salt. Shake evenly over beef. Add chipotle peppers and adobo sauce. Make sure tomatoes and peppers are evenly spread across the brisket. Cover and cook on low for 7-9 hours. 30 minutes before serve time, take two large forks and shred beef. The beef should easily tear apart. Mix throughly, reduce to warm and cover until serve time. Place guacamole in bottom of warmed tortillas. Layer beef into taco. Sprinkle Queso Fresco over the top and serve with Spanish rice. 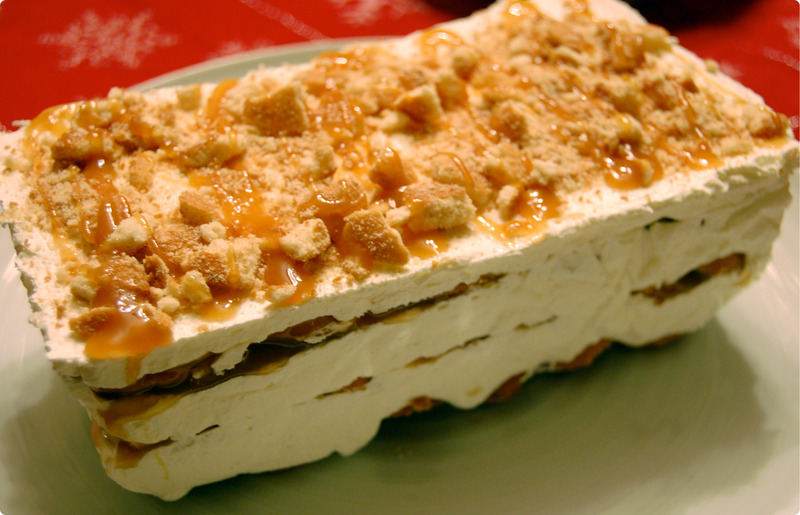 We rounded the meal out with an easy and beautiful Dulce de Leche dessert I found over on Oh My Sugar High. This dessert took less than 10 minutes to whip up and wasn’t too heavy after a big meal. I plan on making different variations in the future! Wishing all of you love and joy this holiday season. 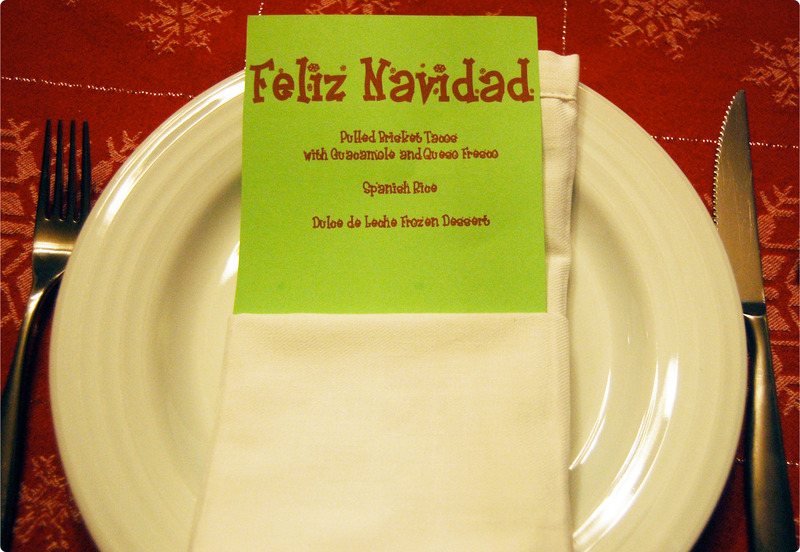 From my table to yours, Feliz Navidad! Love the idea of mixing up a traditional Christmas meal with Mexican food! 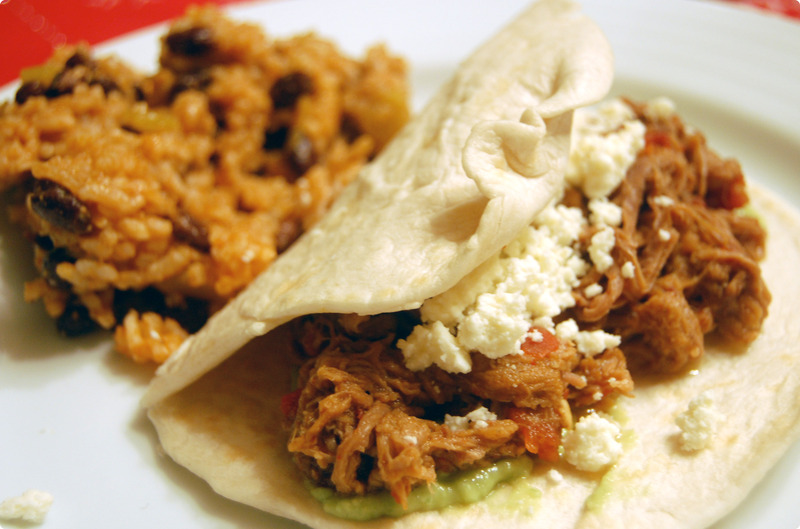 Your picture of your taco has my mouth seriously watering – we may be having an impromtu Mexican fiesta tonight! Oh WOW this is incredible!!!!! I must try ASAP!! I also just love this website!! I did a Rick Bayless Christmas, and it was the best Christmas dinner ever! My aunt does something like this every year. Instead of doing a traditional turkey dinner, her family picks a country – Italy, Brazil, China and Mexico have all been done – and have the cuisine of that country for their Christmas meal. I’ve always thought it was a great way to teach kids about how different people live while avoiding two enormous turkey dinners in the space of a month! Hi- what size can of tomatoes did you use?